The 2016 update is available on the IFLA web site. There were five original trends, and they are trends that are still continuing. Two of the speakers contributed to the report on those original trends. How it is being controlled by various empires. With librarians, there is always of good chunk of people who were on the internet early in its development. Anyone who can get an Internet connection can be a consumer and a creator. 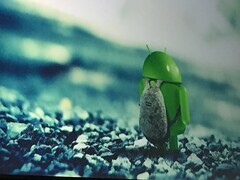 There is competition among smart phones in the US and Europe, but android is more popular in other parts of the world. In India, android 91%. Major app producers are in specific areas of the world - North America, China, Japan and Europe. Meaningful app economies in US and China. Where is the Internet growing? Smartphone growth is in South America, Africa and Southern Asia. We're quickly moving to a small number of centers of power with the Internet. Some people do not know what the Internet is or the diversity of apps that exist. Mathis means that they do not know what is imaginable. Part of Mozilla's mission is to "guard the open nature of the Internet." We need to be vocal about this issue. We should use the environment movement for clues to what we should be doing. They have made the health of the planet a mainstream issue, everywhere. Most countries now have environment regulations and a minister of the environment. We are seeing people coming into the market with environment products, because this is a mainstream issue. We need to make the health of the Internet a mainstream issue, everywhere. This is a core social issue that impacts everything. We must do work on this consistently and actively. Look at the work that occurred with SOPA. Being open source means also supporting hackers who build things and teachers who are digging into digital literacy. Libraries and librarians are a critical part of this. What is an example of an action? Mozilla is focusing this year on copyright. Most of the copyright laws we have were written before the Internet. Most of the laws don't make sense in this digital age. There is an opportunity right now in the EU. They are rewriting the European copyright frameworks and it could be written to inhibit what we take as being normal on the Internet. Now is the time to dig into specific issues. It is also time to talk about how the laws don't current support how we live our lives a public citizens. In Europe, for example, there is no protection for parody. Can we get a public conversation going? Going to do a Maker Party this year to get people together to teach people about the Internet. Want to make copyright the focus of it. Part of it will be to get people to publish things that might start a larger conversation. Contact Melissa Romaine, melissa@mozillafoundation.org if you want to get involved in the Maker Party. Question: Information literacy versus digital literacy? He sees it as a semantic debate. He does have many opinions. Web literacy includes read, write and participate. They do have an advocacy agenda around this. Yes he is willing to be flexible about language. Comment: Ingenious groups need to be a part of this conversation because of differences in copyright and public access. He agrees. Why so much copyright? Why do we talk about it so much? Historically the obstacle to the mission of libraries has been technology and physics. Today Thea has changed quite a bit. Technology is no longer the chief obstacle, even though it is still an obstacle. There are now obstacles that are latent and which were not as important before. Copyright is standing at the center of information technologies. In Europe, copyright is already part of larger conversations. That made sense when copyright was about a few industries and a few commercial contexts. Copyright helped them organize their relationships to one another. For most of history, the specific exceptions were enough. Copyright historically had nothing to say to the individual library patron. Is copyright still fit for purpose? Does copyright make sense in the world of today, where everyone owns a "printing press?" Copyright is with us even more because every digital device makes copies and transmitting them. Copyright has a say in all of those activities. Copyright also regulates all of the services that we take for granted. In a world where every online interaction is governed by copyright, what comes next? Can we change copyright to have a set of flexible limitations and exceptions? He means an exceptions that is not predefined, but can change with technologies. Librarians are part of a larger ecosystem and copyright needs to support that ecosystem. Copyright should not apply when the use of the work is different than the original (transformative). And it should not harm the original market. Countries that have some thought around fair use including US, South Korea, Canada and Singapore. A flexible limitation is not about diminishing the market for publishers. It is about finding those opportunities that are a new source of value. An opportunity - the Trans-Pacific Partnership (TPP) which is a multi-lateral trade agreement. 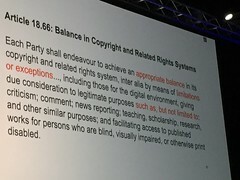 He sees article 18.66 as a a step in the right direction, "Balance in Copyright and Related Rights Systems." ( see photo). This creates a template and an opportunity to go to government officials and state that this is something that 12 leading countries agree to, and this is no longer an alien idea. This is part of today's trade agenda. An international discussion has begun and libraries must be a part of it in Australia, New Zealand, Singapore, South Africa, Japan, and in other places. He agrees that we must build a broad coalition/alliance. We all know there is enormous new value available in these works. We need to update copyright law to take advantage of new technologies and these new values. He believes that policy makers may be ready to listen. Question: How do we work with content creators who seem to believe that librarians are part of a network that flaunt copyright laws? How do we improve our relationship with content creators? Traditional publishers have had a difficult time understanding why the limitations and exceptions exist. TV shows are recognizing the need for flexible exceptions. Can others also loosen their grip on unlimited exclusive rights? He sees that book publishers make be the last to get on board. Start with the parts of the community that are amenable to copyright reform. Comment: Australia is having success in getting people to think differently about copyright. The squeaky wheel has been successful. Book themselves are not an obvious technology. It took 200 years before children's books began. It was 400 years before public libraries began. We have new technologies now in our hands and we need to figure out how to build our civilization using them. - PDF/A with an embedded animation, which will break as software changes. If it is complicated, make it simple. If it's boring make it weird. - Case law limerick generator. - link rot. Digital objects do not stay published as the same way as books. Digital objects stay published as long as their owners are interested in them. See http://ssnat.com 50% of links in Supreme Court decisions suffer from link rot. 70% of law reviews links have rotted. Perma.cc allows you to create a copy of a web page that will not rot. It has quickly Bren picked up a number of law school libraries. 65% of law schools are using it, and others including the Library of Congress. Perma is built using a private LOCKSS network. They use a mixed funding model for their projects. Perma has received some IMLS funding, once it demonstrated that it was successful. Long term it may have some commercial users. Perma relies on the safe harbor provision in US copyright law. Perma is about taking our "shelves" in the library and opening them up to the world. Harvard has case law going back to before the US was founded. 10 million cases. They do live in commercial databases, but they do not live in a form that is open. They have been working with a company called Ravel, which is funding the scanning. They can scan 8000 pages per hour. A vendor OCRs them (case XML). 500,000 pages per week. Their funding model makes bulk data immediately available for academic research. Free individual access through Ravel. All restrictions lifted after eight years. Public any court that publishes its prospective opinions online gets its retrospective cases released. They have built a topic modeling tool that uses the case law. He has also experimented with word clouds focused on specific years and states. H2O casebook publishing platform - how do we publish new things? They are specifically working on textbooks and law books. At Harvard they are using some self-published case books which are printed on demand. Each of the three projects above uses the unique skills of libraries in different ways. Each is funded in a different way. Each of these come out of a curiosity of what we can do together. Whoever wins our presidential election is coming into a time of turbulence in our society. We're experience this turbulence up close because of the cell phone videos that are being shared. Other countries are experience turbulence, too. For example, look at the high number of refugees. We in the US have been having more conversations around equity. Equality does not mean equity. Activist librarianship - it is important that we define our activism. Supports IOS and Android devices. Will be available for chromebooks soon. Specifically available for children in low income families. IMLS funded the software for this. We need to build library technology based on library principles. 10 publishers participated in this. However, the content is not multicultural. This is now a priority. 2) Online education with democratize and disrupt global learning. 3) The boundaries of privacy and data protection will be redefined. The Internet is not distributed the way it used to be. 4) Hyper-connected societies will listen to and empower new voices and groups. The Mukurtu CMS for indigenous communities. This honors other stands of privacy and power. 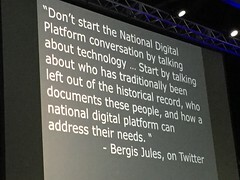 IMLS is challenged to bring more voices into the historical record. (See photo). Are our collections a fair representation of our society? Why are more people from different backgrounds not selecting the library profession? We need diverse voices in our profession in order to ensure that diverse voices are listened to. Exciting examples of embedded librarianship today - librarians and archivists. Documenting the now is one such project. It is a tool for collecting and saving Twitter messages. (DocNow) What are the ethical and social aspects of collecting social media? What happens to original order when you're collecting tweets? A People's Archive of Police Violence in Cleveland - This uses technology to go beyond disciplines and to facilitate conversations. This archive is not part of a library, but does use software originally funded by IMLS. Art+Feminism - a rhizome-tic campaign to improve coverage of women and the arts on Wikipedia. 5) she feels that trend five acknowledges that things continue to change. We need to push back against ignorance and systems of privilege. Question: What is keeping them awake at night? "Truthiness" - are we in a post-truth world? How many children are being left out. If children are behind by third grade, they will never catch up. The future of the web. In five years, could the web be to the Internet what Usenet is to the Internet? Is the web becoming eclipsed by an app world? We cannot take the web for granted.